Manchester United (115), Newcastle United (22), Lincoln City (47), Mansfield Town (108). Busby Babe who made his United debut in 1954. Was part of the United side which won the First Division Championship in 1956 and again in 1957. Injured in the Munich air crash. Liverpool (355), Tranmere Rovers (50). Joined Liverpool in 1952, making his first team debut in February 1953. Liverpool finished 17th in that season, but were relegated after a 22nd place finish in 1954. In the following seven seasons the Reds went desperately close to returning to the top flight with 11th, 3rd, 3rd, 4th, 4th, 3rd and 3rd place finishes until they finally won the Second Division Championship in 1962. Despite being a Second Division player A'Court was selected for the England team ,making his debut in 1957, scoring a goal at Wembley in a 2-3 defeat. The following year A'Court travelled to Sweden as a member of England's World Cup team. He missed the first game against the USSR but played in the following two Group games which saw England finish the group stage level with the Soviet Union, requiring a playoff to see who progressed. A'Court was in the side for the playoff, with England going down 1-0. His final international appearance was against Wales at Villa Park in November 1958. Interestingly, and sadly, A'Court never played in a winning England side. In 1964 Liverpool won the First Division Championship, though A'Court was injured for the whole season. He transferred to Tranmere Rovers in 1964, finishing his League playing career there. Once his playing days were over he held a number of assistant manager roles, including at Stoke City and Crewe Alexandra. Bristol Rovers (214), Plymouth Argyle (3), Stockport County (52), Doncaster Rovers (15). Captain of Bristol Rovers in the late 50s and early 60s. Not known to have appeared in football cards of the period of this website. Everton (24), Luton Town (186), Hull City (21). Dublin-born inside-forward who joined Second Division Everton in 1951, Everton having been relegated the previous season. Played his final game for Everton in April 1953 against Luton Town, then transferred to Luton in August of that year. That season (1953/54) saw Everton promoted, with Luton finishing sixth. The following season Luton were promoted in a very tight season finish, the first time in their history that Luton had made the top flight. In May 1959 Cummins played in the F. A. Cup Final at Wembley, with Luton going down 2-1 to Nottingham Forest. 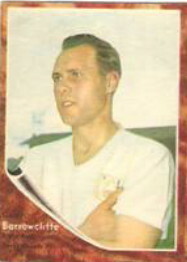 Cummins made his international debut for the Republic of Ireland in 1954, and his final appearance in 1961 for a total of 19 caps. Hartlepool United (189), Derby County (6), Mansfield Town (1). Central defender signed from Burton Albion in November 1965 by Brian Clough who had started his managerial career with the monkey hangers the previous month. Hartlepool finished 18th in the Fourth Division in 1965/66, 8th in 1966/67 (Cloughie leaving in May 1967), and were then promoted with a 3rd place finish in 1967/68. They survived only one season in Division 3, finishing 22nd, then followed this up with a 23rd place finish in Division 4 in 1969/70 and again in 1970/71. In January 1972 Parry was transferred to Derby County at the top of the First Division (Derby went on to win the Championship, though Parry did not make a first team appearance). Many believe that Clough signed Parry in order to help Hartlepool out financially, though the Top Sellers 1974 album notes 'Burton-born player who was previously with Hartlepool, Brian Clough's old club. Limited first-team chances so far, but has the class and ambition to reach the top'. Parry went on to make 6 League appearances for the Rams. Blackpool (363), Preston North End (23), Wrexham (20), Bradford Park Avenue (59). Rothmans League Player Records notes "Ideally built leader of any attack, always going to get amongst the goals, having speed and thrust for good measure. Preston North End must rue the day when they allowed him to leave, later developing with Morecombe in the Northern League. Blackpool were very happy to sign the youngster as a professional in May 1957. Ray almost immediately took over the reins as their leading goalscorer, going on to play for England against France in 1963. After scoring nearly 200 league goals he arrived back at Preston, staying half a season before going on to Wrexham and Bradford Park Avenue." The 1966/67 A&BC card notes: "Blackpool centre-forward. Missed only one league game for Blackpool last season, scoring 16 goals and finishing as their second-highest scorer. A great one for converting the half-chance, he is deadly accurate anywhere near goal. Height 6'. Weight 11st. 7 lbs.". Burnley (211), Bradford City (78). Signed as an apprentice for First Division Burnley, aged 15. Signed professional terms in late 1969, only to see Burnley relegated in 1971. Made his senior debut, aged 20, on 12 February 1972, going on to make 7 first team appearances and 2 subs that season. Was part of Burnley side that won the Second Division championship in 1973. Relegated again with Burnley in 1976, and from the Second Division to the third in 1980. Ingham, the 'Ginger Pele', was an important, but never a permanent, fixture in the Burnley side, playing in many different positions ranging from right-back to centre-forward. He finished his Burnley career with 181 full appearances and 30 subs. Transferred to Fourth Division Bradford City in August 1980, with whom he won promotion in 1982. Rotherham United (118), Sheffield United (154), Newcastle United (30), Doncaster Rovers (35), Chesterfield (66). Joined Second Division Rotherham from the YMCA side in 1955, staying until transferred to Second Division Sheffield United in December 1960, a season which saw the Blades promoted to the First Division. Transferred to newly promoted First Division side Newcastle United in December 1965, but stayed only 12 months before moving on to Third Division Doncaster Rovers as a 31-year old. Rovers were relegated that season, with inside-right Kettleborough staying 11 months before a move to Fourth Division Chesterfield where he ended his League playing career. Not known to have appeared in football cards of the period of this website. Czechoslovakian international who played in the 1970 World Cup tournament in Mexico. He played in the first game against Brazil, being subbed off after 59 minutes (replaced by his younger brother Bohumil), came on as a 69th minute sub in the next game, and then retained his place for the last group game against England. Czechoslovakia lost all three group games. He also played in the 1976 UEFA European Football Championship, scoring in the semi-final and then being on the subs bench for the Final where the Czechs were victorious over West Germany. The 1970 FKS World Cup album notes 'Compact right winger with adroit control, capped 15 times including the vital match with Hungary. Twenty-six year old Slavia development he more than compensates for his lack of stature with ceaseless industry'. W.B.A. (122), Southampton (61), Crystal Palace (58), Wolverhampton Wanderers (40), Plymouth Argyle (105), Bristol City (1), Colchester United (13). The IPC My Favourite Soccer Stars card states: 'A ball-playing midfield genius who joined Argyle in March 1968 after appearing in the colours of West Bromwich, Southampton, Crystal Palace and Wolves. Born in Bristol, he has played for England in Youth and Under-23 teams'. Derby County (475). Full-back who joined Derby from Ilkeston Town in 1950 and went on to play more than 500 games for Derby. At the time he joined the Rams they were in the First Division. They were relegated in 1953, then again in 1955, placing them into the old Third Division (North). They finished second in that League in 1956 when only one team were promoted, but they triumphed the next season, topping the League. Barrowcliffe then played out the remainder of his career in the Second Division. The Rothmans Football League Players Records book notes 'Signed from Ilkeston Town in October 1950; predominantly a full back, but also used at centre forward when the need arose. Making debut in the first division during season 1950/51, was hailed as one of Derby County's best local discoveries for a long time. Member of the County side that dropped from first division to third division north in three seasons, but gaining a medal when missing only one game when helping the Rams back into division two in 1956/7. Was a reliable defender who could play his way out of defence with fair distribution allied to trusty clearances'. Wolverhampton Wanderers (278), Birmingham City (63), Walsall (9), Luton Town (110), Port Vale (18). Left-sided full-back who began his career with Wolves in the First Division in 1961. His early rise saw him selected by Alf Ramsey for a full England cap in November 1963, filling in for Ray Wilson, when England beat Northern Ireland 8-3 in the first ever floodlit match at Wembley. Made seven more England appearances in 1964, deputising for both Cohen and Wilson. Enjoyed a 5th place League finish with Wolves in 1963, but then relegation in 1965. Returned to the top flight in 1967, then transferred to Second Division Birmingham City in March 1969 for £40,000. Left Birmingham in July 1972 as they were promoted back to the top Division. Moved to Second Division Luton Town where he played in all 42 League fixtures in 1972/73 and again in 1973/74 in a season which saw Luton promoted to the First Division for only the second time in their history. Played in 17 of the first 18 games of the 1974/75 season before making way for Steve Buckley, and then struggled for a place in the team. Transferred to Third Division Port Vale in October 1976 where he made 18 appearances before his contract was cancelled in March 1977. Played and coached in the U.S. in the late 70s. The 1968/69 FKS sticker notes 'Made his initial appearance in an F.A. Cup-tie against West Bromwich Albion in January 1962. Was one of the fastest backs in the country. Has accurate distribution and tackle. Professional since July 1962. Under-23 and eight full caps'. Played in the Chilean First Division from 1961 until 1981. Member of the Chilean national team from 1962 until 1975. Was a squad member in the 1966 and 1974 World Cup teams. Fulham (344), W.B.A. (239). Began his professional playing career with Fulham in 1950 in the First Division, though relegated in 1952. Moved back to the First Division when transferred to West Brom in March 1956. Stayed at the Hawthorns for six years in a spell that saw them finish each season in the top portion of the League. Transferred back to First Division Fulham in August 1962 where he stayed as a player until 1967. Made his England debut on 27 November 1957 in a 4-0 win over France at Wembley, Robson scoring twice. Played his 20th, and last, international at Wembley in October 1961. Moved into management in the North American Soccer League but didn't stay for long before returning to Fulham as their manager. Moved on to Ipswich Town in 1969 where he enjoyed a long and successful run. Appointed England manager in 1982 where he stayed for eight years before managerial spells at PSV Eindhoven, Sporting Lisbon, Porto and Barcelona before taking on the Newcastle United job in 1999. A popular commentator and personality, awarded a CBE in 1990 and knighted in 2002, Sir Bobby will be sorely missed. The 1966/67 A&BC Chewing Gum card noted 'Fulham right half. Capped 20 times for England when with West Bromwich Albion. Bobby has proved a valuable addition to Fulham's defence since he joined them in 1962. In charge of the penalty kicks at Craven Cottage, he is a hard-tackling player and a favourite with the crowd'. Burnley (434), Mansfield Town (11). Centre-back who played for Burnley in their 1959/60 championship winning side and the 1962 F.A. Cup Final (loss to Tottenham Hotspur). Appointed manager of Aston Villa in 1967 after they were relegated from the First Division, but lasted less than 18 months. Ipswich Town (409), Hull City (21), Watford (11), Northampton Town (41). 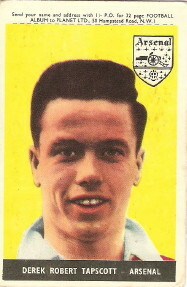 Scottish-born player who joined Second Division Ipswich Town in June 1960. Only 5' 8" he was a wing-half who also played centre back. In his first season with Ipswich they were promoted to the First Division, then, amazingly, won the First Division championship in their first season. Ipswich were relegated in 1963/64, but promoted back to the top flight at the end of the 1967/68 season. In March 1971 31-year old Baxter moved on join Second Division Hull City, then finished his playing career with spells at Watford, on loan, and finally as player-manager at Northampton Town. Northampton finished 23rd in the Fourth Division in Baxter's only season as a League manager. The 1966/67 A&BC Gum card notes 'A strong wing half, Bill joined Ipswich from the junior club Broxborn Athletic in 1960 and has settled down with a regular place in the first team. Likes to come up with the attack, and has developed into a useful extra forward'. 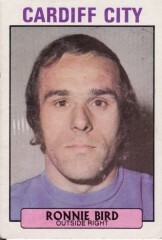 The 1970/71 FKS sticker album adds 'Edinburgh born Scot who has rendered yeoman service at Portman Road... The skipper of the club and a resolute pivot. Has won three championship medals with them'. Bristol Rovers (157). Scotsman signed from Drumchapel in 1962 who played for Bristol Rovers in the Third Division from 1962 until 1970 (last game was as substitute at Bury on 24 October). Later moved to South Africa where he played for a number of teams. Remembered by one fan as 'a "hard as nails" Scotsman who played on the left wing but reverted to left back'. Returned to live in England two years before his death. Not known to have appeared in football cards of the period of this website. Preston North End (447). Republic of Ireland international goalkeeper who joined First Division Preston North End in 1960. Preston were relegated in 1961. Played in the 1964 F.A. Cup Final for Second Division Preston in 1964. Preston were relegated again in 1969/70, though promoted back the following season. Kelly's last game for Preston was played in 1973, after a 13 year playing career. Kelly had two sons who went on to become professional goalkeepers. In the 1980s Kelly was manager of Third Division Preston for a short while, and caretaker manager of the Republic of Ireland side. Chelsea (188), Reading (94). Post-war winger transferred from Falkirk to Chelsea in May 1947. 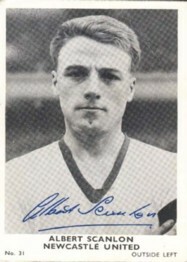 Finished his playing career with Reading in 1957 where he went on to become manager. Switched back to Scotland to manage Dumbarton in 1961 but stayed only one season. Returned to English football as scout for Bristol Rovers, a position he stayed in for 15 years before becoming manager in the late 1970s. Five full international caps for Scotland. Not known to have appeared in football cards of the period of this website. Q.P.R. (393), Luton Town (144), Watford (126). Veteran who began his career with Third Division (South) QPR on amateur terms before turning professional in June 1958. 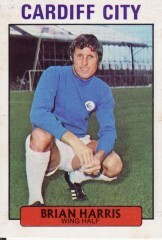 Keen stayed with Rangers through the 1960s, enjoying promotions to the Second (1967) and then First Divisions (1968). In March 1967 Keen was captain of the Third Division QPR side which faced First Division WBA in the League Cup Final at Wembley. 2-0 down at half-time Rangers came back to win 3-2. In January 1969 Keen transferred to Third Division Luton Town to rejoin his old QPR manager, Alec Stock. Won promotion back to the Second Division with Luton in 1970. In July 1972 Keen moved on to Watford where he eventually became player-manager. Finished his playing career with other 660 League games. The 1968/69 A&BC Chewing Gum yellow back card states: "Ranger's captain, Keen has shown tremendous consistency over his 350 plus League and Cup appearances... skippered Rangers to their League Cup triumph in 1967. Took his Testimonial Match, against Chelsea, in May 1968". Tottenham Hotspur (118), Norwich City (106), West Ham United (73), Bournemouth (6). Tottenham apprentice who made his League debut in 1970. In February 1971 he was part of the Spurs team which won the League Cup, 2-0, against Third Division Aston Villa. After eight years at Tottenham Neighbour transferred to Norwich where he stayed a further three years before a transfer back to London with West Ham United. Later played in the U.S., then returned to England where he had a number of management roles. The 1971/72 FKS sticker album notes: "Twenty-year old forward on the left wing he was introduced into the first team as substitute against Stoke City in October 1970. Later made his full bow vs. Bristol City. Turned professional in November 1968 after apprenticeship". Blackpool (428). Played in the 1948 and 1951 FA Cup Finals. 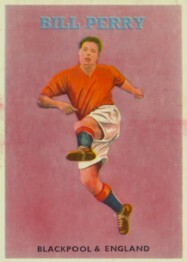 Captain of Blackpool who won one international cap for Scotland. Newcastle United (144), Blackpool (310), Stoke City (9), Southport (6), Bury (34). Newcastle player who won promotion to the First Division in 1965. Transferred to First Division Blackpool in October 1966, though he couldn't prevent the club being relegated. Played three seasons in Division Two before Blackpool's promotion back to the top flight in 1970, though the club's stay in the top Division lasted only the single year. Stayed with Blackpool until his 1976/77 move to Stoke. Member of the Italian squad in the 1962 and 1966 World Cup Finals tournaments. In 1962 he was an unused substitute for the first two group games, Italy drawing 0-0 with West Germany, then losing 2-0 to hosts Chile. In the third game, with Italy unable to qualify for the next stage, midfielder Bulgarelli was in the team and scored two goals in the 3-0 win over Switzerland. He played in all three games in the first round of the 1966 tournament which saw Italy defeat Chile 2-0, then lose to USSR and then North Korea to again fail to qualify for the next round. Leicester City (4), Mansfield Town (89), Rochdale (74), Wolverhampton Wanderers. Midfielder who joined local club Leicester and played in the 1977/78 season, though Leicester finished bottom of the First Division and were relegated. In 1979 Hamilton joined Mansfield in the Third Division - they were also relegated in his first season with them. Diagnosed with heart problems Hamilton moved back to Leicester and made his name as part of the youth development setup, before more recently moving to Notts County and Rushden and Diamonds. Not known to have appeared in football cards of the period of this website. Aston Villa (294), Peterborough (56). 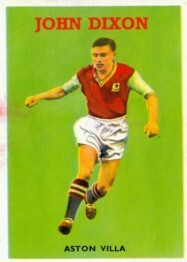 Welsh international wing-half who played for Aston Villa during the 1950s in the First Division. Villa were relegated in 1959 but Crowe captained the side which won promotion back to the top flight the following season and the League Cup in 1961. He played for Peterborough from 1964 until 1967 before returning to Second Division Villa in September 1969. He took over as manager from Tommy Docherty in January 1970 but couldn't prevent Villa's relegation to the Third Division (the first time in their history that they had been in this Division). Crowe oversaw their return to the Second Division in 1972, leaving the club in 1974. In 1975 he took over as a manager in the North American Soccer League, where he had great success. Not known to have appeared in football cards of the period of this website. Aston Villa (430). F.A. Cup winning captain in 1957. 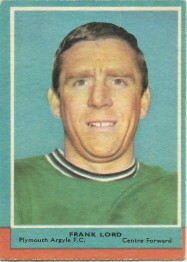 Northern Ireland international who played in the 1958 World Cup team. 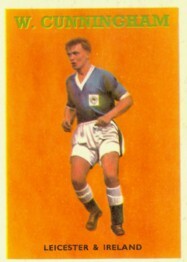 Player in the 1950s for Leeds United, Bournemouth, Newcastle United (including an F.A. Cup Final appearance), Portsmouth and Bristol City. Moved into coaching with a number of clubs, becoming trainer-coach at Everton in the late 60s, then chief coach at Coventry City in July 1972. Became manager of Third Division Grimsby Town in February 1975 when the team were in relegation trouble (they finished the season in 16th position). After a promising start to the 1975/76 season Grimsby struggled again, finishing in 18th. Casey left the club in November 1976, but went on to manage other clubs overseas. Not known to have appeared in football cards of the period of this website. Manchester United (67), Lincoln City (11), Oldham Athletic (22). Full-back through the 1950s and early 60s. Following the end of his playing career in 1964 he became chief coach at Huddersfield Town, then was appointed manager in June 1968. Huddersfield were then in the Second Division, but won promotion to the First Division under Greaves in 1969. They finished a respectable 15th in their first season back in the top flight, but finished bottom and were relegated the following season. They were relegated straight into the Third Division in 1973, on goal difference. In 1974 Greaves moved on to manage Bolton Wanderers, then in the Second Division, where he also enjoyed success culminating in promotion to the top flight in 1978. History repeated itself, with Bolton staying up in their first season, and finishing bottom in their second. Greaves by then had been sacked, moving to Oxford United then Wolves for a short time but ending up at Mansfield Town in the Fourth Division in February 1983. Greaves stayed at Mansfield for six seasons, gaining promotion in 1986. Wolverhampton Wanderers (37). Dunfermline player who, under Jock Stein, won the Scottish Cup in 1961. Moved to England in October 1964 when signed by First Division Wolves for a £28,500 fee. Made a total of 37 League appearances for Wolves (who were relegated at the end of the 1964/65 season) before being transferred back north by Hearts in November 1965. Moved into management in 1972 where he had stints with Dunfermline, Falkirk and Hamilton Academicals. Not known to have appeared in football cards of the period of this website. Port Vale (28), Bolton Wanderers (105), Burnley (213). Signed professional for First Division Everton in 1977, but never made a first team appearance with the Toffees. Moved to Fourth Division Port Vale in 1981, then to Second Division Bolton in 1982. Transferred to Burnley in 1985 to help with their struggle in the Fourth Division. Retired from football in 1990/91. Not known to have appeared in football cards of the period of this website. Bristol City (26), Ipswich Town (41), Exeter City (157), Torquay United (12). 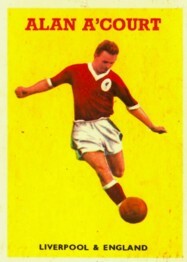 Joined Bristol City from his native Ireland in 1956 in the Second Division. Transferred to Ipswich Town in September 1958 and played in the team which won promotion to the First Division in 1961, and won the First Division championship the following year under Alf Ramsey. Not known to have appeared in football cards of the period of this website. Glasgow Rangers legend and skipper, with 362 League appearances as a defender from 1945 until 1960, including six Scottish League championships. Appointed Scottish national team manager upon retiring as a player and guided the Scots to win the Home Championships in 1962 and 1963. Became Sunderland manager in the English First Division in mid 1965, bringing Jim Baxter south of the border. Sunderland finished 19th in 1965/66 and 17th in 1966/67. He was replaced as Sunderland manager in February 1968. Not known to have appeared in football cards of the period of this website. Notts County (245), Lincoln City (7). Played for Notts County through the 1950s and early 60s, mainly in the Second and Third Divisions. Moved to Lincoln City in late 1966 as a member of the coaching staff but pulled his boots back on for a handful of games (Lincoln finishing bottom of the Fourth Division in that season). Appointed Lincoln manager in 1970, but moved back to the coaching role in 1971. Stayed with the club until the late 1980s. Not known to have appeared in football cards of the period of this website. Leicester Ciy (335), Rotherham (6). Born in Aberdeen, played for Banks O'Dee in Scotland, signed from there by Leicester in August 1958. Made his League debut in 1960, and went on to play in the 1963 F.A. Cup Final (defeat), the 1964 League Cup Final (win) and the 1965 League Cup Final (defeat). Missed the 1969 F.A. Cup Final defeat due to injury. The 1968/69 FKS sticker notes "Scot from Aberdeen who was right-back in the 1963 Cup Final but has now settled as a formidable, rock-like pivot". The 1971/72 A&BC purple-back card notes "Leicester's longest-serving player, and one of the most experienced defenders in the League, Sjoberg is primarily a centre half, but has also played at full back and centre forward". Wolverhampton Wanderers (273), Manchester City (70), Walsall (58). Centre-forward. Member of brilliant Wolves squad of the 1950s which captured 3 League championships, also a member of F.A. Cup winning side of 1960. Moved to Second Division Manchester City in November 1963 and was part of the team which won promotion back to the top flight in 1966. Not known to have appeared in football cards of the period of this website. Bradford Park Avenue (12), Brighton and Hove Albion (55), Aldershot (31). Scotsman who didn't quite make the grade as a player in the League, retiring in 1957. Moved into management with Fourth Division Brentford in 1967. His big move came when he joined Notts County in November 1969, themselves a struggling Fourth Division club. Under Sirrel they were promoted in 1971, and again in 1973, into the Second Division. In 1975 Sirrel was appointed manager at First Division Sheffield United, but this was a disastrous move , with the Blades relegated in 1976. In early 1977, with both Sheffield United and Notts County in the Second Division, Sirrel moved back to Notts County. In 1981 they were promoted to the First Division, returning for the first time since 1926. They stayed for three seasons in the top flight under Sirrel. Not known to have appeared in football cards of the period of this website. Wolves (344). 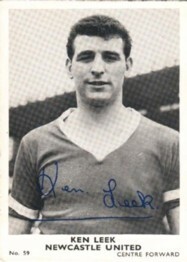 Star full-back for Wolves in the post-war period. Played in the winning team in the 1949 F.A. Cup Final, and won First Division Championship honours in 1953/54. Once his playing days were over Bill moved into coaching with Birmingham City, Aston Villa and the England youth team. Filled in as caretaker manager for Birmingham in the Second Division at the end of the 1969/70 season. Port Vale (83), Scunthorpe United (3), Crewe Alexandra (8), Rochdale (98), Huddersfield Town (14), Halifax Town (62), Stockport County (9). Striker who signed professional in 1970 and made his League debut in 1971. Moved to Australia in the 1980s where he played for a number of clubs. Moved into coaching and made a big impression around the Newcastle (NSW) area. Bradford Park Avenue (208), Bradford City (11). Bradford-born left-back. Not known to have appeared in football cards of the period of this website. Sheffield United (37), Ipswich Town (66), Crystal Palace (45). Centre-forward. Began his career with the Blades as a 17-year old in 1965, moving to Ipswich for £33,000 in 1969. Made two international appearances for Wales in October and November 1971 when his career was perhaps at its top. Moved on to Palace for £35,000 in December 1973. Cardiff City (400). Cardiff City player for 18 years, including the promotion season of 1951/52 to take the Bluebirds to the First Division for a five year stay then again in 1959/60 for a two year stay. Finished his League career in 1963/64 in the Second Division. Became a trainer at Cardiff for 12 months, then first team trainer Newport County where he stayed until 1976. Made two international appearances for Wales in 1952 and 1957, and later was the kit man for the team. Not known to have appeared in football cards of the period of this website. Arsenal (119), Cardiff City (194), Newport County (13). One of 16 children, 'Tappy' began his career with Barry Town before signing for Arsenal in 1953. Made his international debut for Wales as an 18-year old on May 9, 1954 against Austria in Vienna less than one month after his first-team debut for the Gunners. He went on to make 14 appearances for his country (last appearance on 22 April 1959 in Belfast, where he scored against Northern Ireland). Transferred to Cardiff City in 1958 after losing has place in the Arsenal team. Was part of the Cardiff promotion winning side of 1959/60 and played two seasons in the First Division before relegation in May 1962. Finished his League career in the Fourth Division at Newport in 1965, but played on in non-League until aged 39. Bolton Wanderers (188), Notts County (8), Reading (87), Bury (86). One of only a few football players in the 1960's and 70's to have played in all four divisions. He began with First Division Bolton in 1962, going on to become their central defender and captain. Bolton suffered relegation in 1964, and again in 1971, leading to Third Division football for Hulme. At the end of the 1972 season Hulme transferred to Fourth Division Reading where he played as captain and stayed for two seasons before a transfer to Third Division Bury. In 1976 he accepted a player/managers role for the Swiss team FC La Chaux-De-Fonds. He hung up his boots in 1979 after receiving an injury to his Achilles heel, which even after surgery, prevented him from playing again (Information kindly provided by his son). The 1972/73 Barratt's Soccer Stars card notes: "John is the ideal build for a half back. He tips the scale at 12st and is 6ft ¼ ins. He came to the Lancashire side from school. He was born in Mobberley. John has made more than 170 appearances for Bolton and pops up with the odd goal". Norwich City (3), Scunthorpe United (88), Oxford United (116), Cambridge United (54). See Bob Dunning's Nigel Cassidy page for a full bio. Not known to have appeared in football cards of the period of this website. Celtic (352), Kilmarnock (151). Celtic favourite who began his League career in 1975 and played for the Hoops for 14 years. Moved to Kilmarnock in 1989, becoming their player-manager in 1992. Became Celtic manager in 1994 before moving on to management spells with Newcastle United and Reading. Assistant manager of the Scottish national side in 2002 under Berti Vogts. Returned to Celtic and became first team coach under Gordon Strachan. The FKS Soccer 82 sticker album notes "Midfielder. Left-sided player who can also operate in attack. Has represented Scotland at Under-21 level. Ht. 5.10. Wt. 10.7. Tottenham Hotspur (29), Chesterfield (9), Newport County (272), Wolverhampton Wanderers (147), Swansea City (12), Burnley (2). Goalkeeper who began his career at Tottenham as an apprentice, making his League debut in the First Division at Norwich City on 4 November 1978 as a 20-year old. Made 23 appearances that season. Joined Newport County where he enjoyed a long career. Signed for Wolves when they were in the 4th Division. Played in the victorious Sherpa Van Trophy side at Wembley in 1988. Not known to have appeared in football cards of the period of this website. 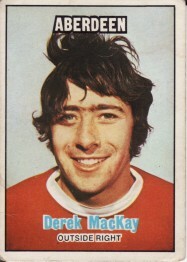 'Cup-tie' McKay scored four goals for Aberdeen in the Scottish Cup in 1970, one in the quarter-final, one in the semi-final and two in the Final against Celtic. The Aberdeen team that day included the likes of Martin Buchan and Joe Harper. Left Aberdeen after only 18 appearances and moved to Crystal Palace, though he never appeared in the League for them. Transferred to Barrow in 1971 where he made 18 League appearances without scoring in a season where Barrow finished 22nd in Division 4. His last League game was at Reading on 22 January 1972, after which he was given a free transfer. Played overseas before settling in Australia. Scottish-born centre-half who played for Celtic, West Ham United (38 appearances between 1967/68 and 1969/70), Dunfermline Athletic and Dumbarton. The FKS 1968/69 album notes 'Secured from Glasgow Celtic in June 1967 where he had been a pivot and part-timer, combining football with schoolmastering. Scottish schoolboy and youth international he had been discovered playing with Blantyre Celtic in 1961'. Playing career from 1946 to 1953. Manager of Sheffield Wednesday for 1971/72, 1972/73 and part of 1973/74. Eventually became Chairman of Sheffield United. Not known to have appeared in football cards of the period of this website. Played in the Haiti national team for their one and only appearance in a World Cup Final in 1974 in Munich, scoring both of their goals. Probably best known for scoring the goal against Italy which gave them the lead and ended Dino Zoff's record of not conceding a goal (1,142 minutes). Everton (310), Cardiff City (149), Newport County (85). The 1971/72 A&BC card states 'A very experienced wing half, Harris was with Everton for many years, making 310 appearances for the Goodison Park club before moving to Cardiff City. A hard-tackling defensive wing half, Harris has been a great asset to the Welsh club, and is fast approaching 150 appearances for them'. The Rothmans Football League Players Records book notes 'Started out as highly promising outside left being signed by Everton from Port Sunlight as a part timer, combining football with an engineering apprenticeship. Began to claim a regular spot in 1957/58 when settling down at wing half keeping his place for many seasons and a gaining a League Championship medal (1962/63) to go with the F.A. Cup Winners medal from the game against Sheffield Wednesday at Wembley 1966. Had developed into a classy constructive defender, who was unlucky not to be capped, and although losing his place to Tony Kay, was soon recalled when that player left the game over the bribes scandal. Later played for Cardiff City and then Newport County, whom he later managed'. Bradford Park Avenue (176), Burnley (74), Sunderland (212). Managed Libyan national football team 1961-63. Was part of the backroom staff when Sunderland won the FA Cup in 1973. Took over as caretaker manager at Roker Park for a brief spell in 1978. Not known to have appeared in football cards of the period of this website. Scunthorpe United (116). Defender who played for Scunthorpe between 1969 and 1974 in the Third and Fourth Divisions (playing in the same side as Kevin Keegan from 1969 to 1971). Played his last League game on April 26th, 1975 at home to Stockport County (0-0 draw). The previous week they had lost 7-0 to top of the table Mansfield. Scunthorpe unfortunately finished 24th that season in the Fourth Division. Atkin apparently quit football at this time to concentrate on his teaching career. Not known to have appeared in football cards of the period of this website. Barnsley (49). 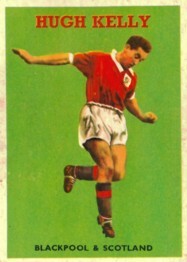 Played for Barnsley from 1938 to 1948. Injury cut short his career but he stayed on at Oakwell as a coach, becoming manager from 1960 until 1971 (a difficult time for the club), and again in a caretaker role in 1973. Became General Manager in 1970, and Life Vice-President after that. Known by many as "Mr Barnsley". Not known to have appeared in football cards of the period of this website. Manchester City (16), York City (219), Bury (31), Bradford City (23), Huddersfield Town (38), Bournemouth (9), Colchester United (4). Began his career as a centre-half in the First Division but subsequently played his remaining games in the 2nd, 3rd and 4th Divisions as a striker. Not known to have appeared in football cards of the period of this website. Orient (279), Millwall (80), Wimbledon (119). Goalkeeper signed by Orient as an apprentice from Fulham in March 1967. Played in the (old) Third Division until Orient won the Third Division title in 1969/70. Played in the 1973/74 season when Orient missed out on promotion to Division 1 by one point (they started the season brilliantly and then won only 2 of their last 15 games). After the end of his playing career, in the early 1980s, Ray moved to Spain where he lived until his early death. The 1969/70 My Favourite Soccer Stars card states 'Very agile and capable goalkeeper. Born in South-west London, he became an apprentice with his local club Fulham but was not retained. So he joined Orient in 1967, gained a first team place in the 1967/68 season, missing only one League game". Leeds United (9), Brighton and Hove Albion (166), Fulham (323), Q.P.R. (87). Brighton captain who was transferred to Fulham in 1957 for a £12,000 fee. Played for Fulham in 1958 and 1963 F.A. Cup semi-finals. Was part of their 1958/59 promotion winning team to reach the top flight. Won the League Cup with Q.P.R. as a Third Division side, helping them comeback from 2-0 down at half-time to beat W.B.A.. The 1966/67 A&BC card notes 'Queen's Park Rangers left back. Formerly with Fulham, Jim, who has a tremendous left-foot shot, has gained three caps for England. A hard-tackling full back, he started his career with Brighton and Hove Albion before coming to Queen's Park Rangers via Fulham in the 1965 close season. Height 5'9". Weight 12st. Tottenham Hotspur (67), Southampton (36). Goalkeeper for Tottenham Hotspur through the 1950s, often as second choice. 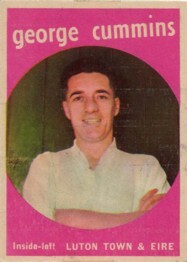 Transferred to Southampton in 1963/64. Sustained a serious knee injury in September 1965, ending his League career. Not known to have appeared in football cards of the period of this website. Played for Liverpool and Burnley in the 1940s and 50s before moving into coaching at Everton and Arsenal. Appointed manager of Second Division Bury in1966. Installed as Blackpool manager at the start of the 1969/70 season and guided them back to the First Division. Managed the Tangerines for only two months of the 1970/71 season in the First Division before moving on. Subsequently managed teams in Greece for many years. Not known to have appeared in football cards of the period of this website. Northampton Town (86), Leicester City (93), Newcastle United (13), Birmingham City (104), Bradford City (99). Forward who played 13 times for Wales in a career spanning from 1952 to 1968. Scored two goals for Birmingham City in their 1963 League Cup Final win over rivals Aston Villa. Coventry City (5), Norwich City (290), West Ham United (115)., Millwall (5). Won the Division Two title with Norwich City and promotion to the top flight for the first time in their history in 1972. Played in F.A.Cup, League Cup and European Cup Winner's Cup Finals. The 1979/80 Sun Soccercard notes "Power house displays from Graham are a feature of his play. Joined Coventry from school and made his league debut against Liverpool in September, 1969. Norwich City paid £25,000 for him in October, 1969 and after nearly 200 first-team games was transferred to West Ham in an exchange deal with Ted MacDougall. Notched up over 100 games with West Ham before rejoining Norwich in 1976". Sheffield United (632). Holds the record for the most league appearances for the Blades, between 1948 and 1966. Played a total of nine seasons in Division One. Had three spells as club captain. Not known to have appeared in football cards of the period of this website. Rumanian national midfield player. Played for F.C. Arges for 22 years and was technical director at time of his death. Was in the squad but did not play in the 1970 World Cup finals tournament. The FKS Mexico 70 Album notes "Twenty-three year old schemer in midfield who has twice been voted Player of the Year in recent years. Can produce a smooth rhythm in the side and has been capped on 20 occasions by Rumania. Plays for Arges Pitesti". Blackpool (394), Southport (26), Hereford United (29). Soth-African born footballer who played with Blackpool during the glory days of the 1950s, including scoring the winning goal in the 1953 F.A. Cup Final. Made his full England debut at Wembley against Northern Ireland in November 1955. Scored twice four weeks later against Spain. Made his third and final appearance for England in April 1956 against Scotland in Glasgow. Lynemouth Colliery, West Ham United (281), Orient (83), Charlton Athletic. 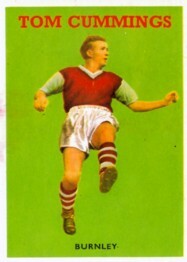 Member of the Second Division Championship team of 1958 for West Ham. Part of the initial squad of 26 selected for England's 1962 World Cup campaign, but didn't make the final 22. Player-manager at Orient. Chairman of the Professional Players Association from 1962 to 1966. Assistant Manager at Manchester United under Frank Farrell. Not known to have appeared in football cards of the period of this website. Raith Rovers, Sunderland (228), Reading (5), Sheffield Wednesday (106). Manager at Rotherham United, Sheffield United, Aberdeen, Reading, Chelsea, Zambia, Zimbabwe, Oman, Armenia. Best remembered as a player for his 30th minute goal to win the 1973 F.A. Cup Final for Sunderland against Leeds United. The 1973/74 FKS album noted: "Former Raith Rovers wing-half secured in December 1967. Had had some experience of Scottish League football before coming to England, having also played for Lochore Welfare whom he originally linked up with in 1961." Leeds United (95), Birmingham City (74), Bristol Rovers (31). 15 international caps for Wales. The FKS Soccer Stars 80 album notes "Welsh born defender with youth, Under-21 and three full honours for his country. Made his debut against Sheffield United, April 1975 at full-back. Had further opportunities in the next few seasons". St. Mirren (61), Leicester City (127), Dunfermline Athletic (70). 30 international caps for Northern Ireland. Went into management in Scotland once his playing days were over. Walsall (111), Luton Town (336), Derby County (13), Birmingham City (6), Swindon Town (7), Cambridge United (75), Torquay United (6). Player/coach at a number of clubs. Not known to have appeared in football cards of the period of this website. Bournemouth (7), Aston Villa (17), Walsall (5), Colchester United (62), Cambridge United (41), Brentford (52). Scored one of the goals in Colchester United's 1971 3-2 F.A. Cup win over Leeds United. Not known to have appeared in football cards of the period of this website. Portsmouth (33), Blackburn Rovers (59), Aston Villa (51), Peterborough (77), Leicester City (68), Wolverhampton Wanderers (258). Chairman of the Professional Players Association in the 70s. The Barratt's A14 card notes: "One of the outstanding 'characters' of modern soccer ever since he left his native Belfast as a 17-year old, transferred from Distillery to Portsmouth. Has since moved to Blackburn, Aston Villa, Peterborough and Leicester for fees which hardly reflect the natural ability of this talented, free-scoring centre-forward. With more consistency could have been one of the very great." Defender who played for Standard Liege in the Belgium League. International who appeared in the 1970 World Cup in Mexico. The FKS Mexico 70 World Cup album notes: "Twenty-two year old centre back of Standard Liege who missed only one League game for his club last season. Club debut in 1964-65, won his first cap vs. Holland in April 1968 and has now been capped on four occasions". Rumanian striker who played in the 1970 Mexico World Cup. He scored 15 goals in 31 international appearances, including being top scorer for his country in the Mexico tournament. The FKS Mexico 70 album notes: "At 21 is a clever leader with a deft change of pace, fine ability in the air and on the ground. Top scorer with 22 goals in the League last season and voted Footballer of the Year. Ten caps with Dinamo Bucharest". Blackpool (146), Everton (208), Arsenal (177), Southampton (195), Bristol Rovers (17). One of the true legends of the game, Alan Ball made over 700 league appearances as a player, and 72 international appearances for England. He will be remembered especially for his role as the youngest member of the 1966 World Cup winning team, but his contribution to the game continued through playing roles until 1983 and in management roles until 1999. Died of a suspected heart attack. The Barratt's A13 card notes: "Stands around 5ft. 6ins., weights less than ten stone - yet the fiery, flame-haired Ball has a heart as big as a house. Had a great season in 1964-65 and the climax came in Belgrade when he made his England debut at inside-left in a 1-1 draw with Yugoslavia. Alan kept his place for the subsequent tour games in Germany and Sweden, and then went back to the Continent with the Under-23 side. At 20 he must have a bright future.". Alan Ball appears in more English football cards in the period 1965/66 to 1979/80 than any other player and therefore has a special place on this site. W.B.A. (114), Colchester United (100). Right-back who played for West Brom in their League Cup Final win in 1966, and was captain of Colchester United in their 1971 giant-killing win over Leeds United. Moved to Canada later in his life, where he died of a heart attack. Bobby Cram was the uncle of famous middle-distance runner Steve Cram. The Barratt's A13 card notes: "For long, rated as one of the finest reserve players in the Midlands, Bobby finally gained a regular first team spot with West Bromwich at the start of 1964-65 following the departure of Don Howe to Arsenal. The adventurous Cram soon showed himself to be a capable full-back as well as a long-shot specialist, and he scored a hat-trick in one League game". Newport County (363), Swansea City (12). Also played county cricket for Glamorgan. Not known to have appeared in football cards of the period of this website. Burnley (379). Died after a short illness. Played in the side which won the First Division in 1959/60. Later managed Burnley, including Third Division championship in 1981/82. The 1966/67 A&BC card notes: "Burnley centre half. A tall, dominating centre half, especially good in the air, Brian has become the king-pin of the Burnley defence, playing in all 42 of their league games last season. Another of their fantastic wealth of local talent, he can be dangerous when near goal and has notched several vital goals. Height 5' 11¾".Weight 13st.". Nottingham Forest (15), Notts County (223), Gillingham (20). Not known to have appeared in football cards of the period of this website. Eastbourne, Charlton Athletic (4), Newport County (55), Swansea City (17), Gillingham (109), Northampton Town (24), Millwall (97), Reading (99), Swindon Town (61), Brentford (29). The Rothmans Football League Players Records book notes: "Much travelled centre forward, tall, well-built with an eye for the goal, arrived at Charlton from Eastbourne and went on to play in all four divisions, scoring over 200 league goals. Only on one occasion played in a side that gained promotion, when with Millwall 1961/62, after being signed from Northampton Town to score valuable goals - which he did, netting 13 from 17 appearances." Not known to have appeared in football cards of the period of this website. Kettering, Stoke City (270), Sheffield Wednesday (89). The FKS 1968/69 album notes: "Tall, well built leader who joined the club from Stoke City in November 1966. Discovered playing in works football by Kettering Town and moved to Stoke in June 1962. Cost Wednesday £70,000. Football League honours.". Nottingham Forest, Halifax Town (17). Not known to have appeared in football cards of the period of this website. Wrexham (84), Birmingham City (23), Rotherham United (76), Leeds United (69), Huddersfield Town (21), Chester City (3), Altrincham. 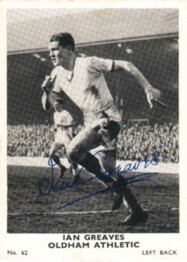 Top scorer for Leeds United under Don Revie when they won promotion from Division Two in 1963/64. Not known to have appeared in football cards of the period of this website. A.C. Milan, Juventus. Played in 1962 and 1966 Italian World Cup teams. Died of a heart attack. The FKS Mexico 70 album notes: "Thirty year old sweeper who marshals the defence well. Milan born he moved from AC Milan to Juventus in 1962. First capped in December 1960 he now has 26 caps as well as over 250 First Division appearances.". Birmingham City (171), Middlesbrough (40), Cardiff City (66). Not known to have appeared in football cards of the period of this website. Everton (36), Blackburn Rovers (166), Tranmere Rovers (180). 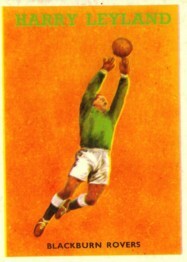 Goalkeeper who played for Blackburn Rovers in the 1960 F.A. Cup Final. Birmingham City (212), Wrexham (52). Goalkeeper who played in the 1963 League Cup final for Birmingham City against Aston Villa (Birmingham winning 3-1 on aggregate). Not known to have appeared in football cards of the period of this website. Newcastle United (27), Everton (10), Manchester City (162), Bury (37). The FKS 1968/69 album notes: "A Geordie from Newcastle he went to United from school in 1959. Transferred to Everton in March 1962 but found opportunities limited. Moved to Manchester City in September 1965. Powerfully built, balding stopper. Under-23 cap.". Internazionale, Italy. Played in 1966, 1970 and 1974 World Cup tournaments. The FKS Mexico 70 album notes: "Attacking left back with fine scoring record. Is 27 and has been with Internazionale since he was 18. Made his Italian bow in March 1963 and now has 42 caps. Over 250 Serie A appearances. Born Treviglio.". Sunderland (1), Northampton Town (306). The 1969 My Favourite Soccer Stars card presented with the Lion comic notes: "A Scot from Ayrshire who has played in more than 200 League games for Northampton as a strong, defensive wing-half or full-back. He spent his earlier years with Sunderland and signed for Northampton in 1964. They never made a better capture.". Liverpool (99), Dundee, Watford (134). Won Scottish Cup Final winner's medal with Falkirk in 1957. Also represented Scotland as a full international. Died from heart attack while playing golf. Not known to have appeared in football cards of the period of this website. Barrow (106). Centre-forward with two claims to fame in the Football record books. In season 1965-66 he became the first substitute to score a goal. He followed this on December 27th 1965 by becoming the first substitute goalkeeper to save a penalty when he stopped a spot-kick from Alick Jeffrey of Doncaster Rovers. Not known to have appeared in football cards of the period of this website. Sunderland (285), Preston North End (224), Stockport County (30). Not known to have appeared in football cards of the period of this website. Manchester United (53), Blackpool (7), Southport (197), Tranmere Rovers (74), Halifax Town (40). The 1972/73 FKS album notes: "Won schoolboy honours for England at both Rugby League and soccer. This 19 year old hails from St. Helens. Made his senior debut at full-back two seasons ago in May 1971 against Manchester City. Now established. Ht. 5ft. 6in. Wt. 10.4.". The FKS 1970/71 album notes: "Captain for six seasons and centre-back who turned professional in July 1957. Made his League debut in March 1958 and has now completed 400 League appearances. An Under-23 and now a full international with 26 caps. Ht. 6ft. 1in. Wt. 12.11.". Manchester United (36), Preston North End (143), Brighton & Hove Albion (112), Lincoln City (20). Appeared in 1967 Lion & Champion Album of Soccer Stars (image not available). Wisbech, Newcastle United (86), Blackpool (11), Northampton Town (165). Goalkeeper who played for Northampton Town in their one and only appearance in the First Division in 1965/66. Not known to have appeared in football cards of the period of this website. Celtic (308), San Jose Earthquakes, Sheffield United (11), Dundee, Shelbourne, Elgin City. Died after four year battle against motor neurone disease. Won nine consecutive Scottish League titles with Celtic between 1965 and 1974. The FKS 1970/71 album notes: "Mercurial little outside-right with red hair. Came from the Blantyre Celtic club in 1961 and won his first cap for Scotland v. Wales in October 1964. Now has ten full honours as well as Under-23 and Scottish League. Ht. 5ft. 4in. Wt. 9.2.". Chelsea (289), Southampton (126), Norwich City (3). The Top Sellers Football 73 card notes: "Talented striker who has played for England several times. Turned professional with Chelsea in 1964 and, despite broken leg two years later, has risen to the top of his trade." Wrexham (185), Liverpool (0), Doncaster Rovers (1), Chester (137), Rochdale (2), Crewe (4), Bangor City, Oswestry Town. Died suddenly in his sleep at home. Not known to have appeared in football cards of the period of this website. Manchester United (361), Stockport County (3), Fulham (42), Bournemouth (5). The 1968/69 FKS album notes: "Brilliant individualist attacker who had his senior debut in September 1963 and won his first Irish cap the following April. Came from schools soccer in Belfast as an amateur, turned professional May 1963. Thirteen caps.". The My Favourite Soccer Stars card presented with the Buster comic notes: "One of the greatest inside-forwards of modern times. Born in North London, he played for England Schoolboys in 1950 and joined Fulham. He's been there ever since and played in nearly 600 League games. He won Youth and Under-23 caps before he became England's captain (56 caps).". Cork, West Ham United (245), Manchester United (123). Chesterfield (155), Derby County (107), Lincoln City (24), Darlington (26), Halifax Town (25), Rochdale (27). Not known to have appeared in football cards of the period of this website. Port Vale (335), W.B.A. (1). Not known to have appeared in football cards of the period of this website. Wallsall (458), Newcastle United (33), Crystal Palace (49). The 1969/70 FK album notes: "Red haired outside left with a goalscoring reputation. Started as a part-timer with Stourbridge and joined Walsall in 1958. Hit 150 goals in 10 seasons including a spell with Newcastle and went to Palace in May 1968. Ht. 5ft. 8½in. Wt.12.0.". Rochdale (120), Crewe Alexandra (108), Plymouth Argyle (76), Stockport County(27), Blackburn Rovers (10), Chesterfield (12). Ashton United, Liverpool (41), Bury (45), Rochdale (41). The 1968/69 FKS album notes: "Fair-haired, bustling centre-forward who was signed from Ashton United in August 1960. Despite few opportunities for senior outings he has managed to average a healthy quota of goals. Manchester born.". Barrow (91), Bury (6), Colchester United (27), Southport (63), Darlington (54). Not known to have appeared in football cards of the period of this website. Luton Town (43), Lincoln City (168), Torquay United (34). Not known to have appeared in football cards of the period of this website. Birmingham City, Bradford Park Avenue (129), Bury (13), Cardiff City (97), Crewe Alexandra (19). The A&BC purple back card notes: "A very experienced forward, Bird has been a regular goalscorer throughout his career. Powerfully built, with a strong shot, he joined Cardiff from Bury in February, 1966. Previously with Birmingham City and Bradford Park Avenue.". Airdrieonians, Crystal Palace (25), Motherwell. The Top Sellers Football 73 card notes: "Strong full-back who made several first-team appearances last season. Always ready to move upfield when a chance presents itself and has scored several shock goals for Palace.". Southampton (25), Chelsea (39), Gillingham (47), Watford (64), Northampton Town (28), Brighton and Hove Albion (125). The Barratt A13 card states: "Signed from Watford at a substantial fee the previous summer, injuries prevented Livesey making a full contribution to Northampton's 1964-65 success in gaining promotion to the First Division. Something of a wanderer, sharp-shooting, centre-forward Charlie has also played for Southampton, Chelsea and Gillingham in an up-and-down career". Coventry City (6), Torquay United (21), Crewe Alexandra (96), Chester City (9), Watford (107), Aldershot Town (109), Swansea City (4). Not known to have appeared in football cards of the period of this website.